All the classic "Star Wars" characters have been turned into cars, including Rey and Kylo Ren from "The Force Awakens." It's a good time to be a "Star Wars" fan. This year at the 2016 New York Toy Fair, there were "Star Wars" toys galore, thanks to the explosion of new movies and shows related to the franchise. Characters and plot points from "The Force Awakens" — Episode 8 in the central "Star Wars" saga — has had an especially heavy impact on toys this year. Aw, look, it's Chewie as a car! All the major "Star Wars" characters get transformed into vehicles in this fun toy line — new additions include a First Order Stormtrooper, Rey and Kylo Ren from "The Force Awakens." 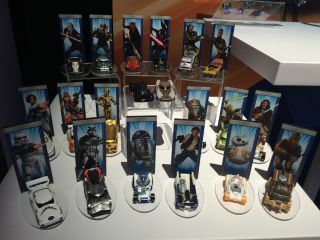 Mattel also has new entries into the Hot Wheels Star Wars Starship line, consisting of various ships from the franchise. Behold, the Star Wars Remote Control Zero Gravity TIE Advance X1 from Air Hogs! The little drone's propellers are hidden inside the body of the ship, so it actually looks as though it is flying through space, rather than through air. Total awesomeness. Spin Master released another awesome drone modeled after the starship Enterprise NCC-1701A from the "Star Trek" universe. Oh, my goodness these are so cuuuuute! The "Star Wars" Egg Attack action figures by Beast Kingdom are some of our favorite action figures. The new additions to the series include clone troopers, Kylo Ren and Captain Phasma, all from "The Force Awakens." However, these tiny statues are for display, not play, as they retail for about $90 to $180. There are other super cute (more affordable) "Star Wars" figures in the Space.com store. We're big fans of Uncle Milton toys. They manage to merge science and playtime in a truly seamless way. We've already written about various awesome toys from this company, including their Jedi Force Trainer, in which players use brainwaves to accomplish tasks and defeat enemies in a holographic video display. In 2015, the company introduced a build-your-own lightsaber room light (mini or full size). There's a new Kylo Ren addition, so kids can build the three-pronged red lightsaber. Other classic Milton toys, like the lightsaber crystal growing lab and the ant farm, are also getting updated to include characters and elements from "The Force Awakens." Keep your eyes peeled this year for the Spacecraft Flight Lab, which will use various "Star Wars" ships to teach kids about aerodynamics and flight; or the Force Spinners, which let kids control BB-8 and R2-D2 with "the Force" — the magnetic force, that is.